Cornucopia Plus™ Advantage Grow fertilizer stays in solution with no salt residue to settle out or accumulate in the bottom of the nutrient tank and clog irrigation emitters. Cornucopia Plus™ Advantage Grow is used for leafy veggies to prolong the vegetative cycle, keeping cutting (stock plant) productive, with lush green vegetation without pushing for reproduction and early maturity. Our repeated lettuce trials have produced harvests up to 4 weeks after maturity without any bitterness and with minimal, if any bolting. Harvesting even those plants, for cutting mix with no bitterness, for seedlings and fresh cuttings, for strong vegetative growth. 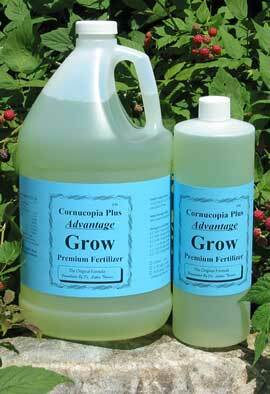 Cornucopia Plus™ Advantage Grow provides a level of sulfur and magnesium lacking in many fertilizers. Sulfur plays a metabolic role in photosynthesis and carbon dioxide fixation. Sulfur and magnesium are the key components of chlorophyll production. Magnesium influences the size of roots. Water-soluble plant extracts provide auxiliary, salt-free metabolites for assisting nitrogen assimilation, root development, and respiration. Wetting and solubilizing agents minimized salt build up in growing media while enhancing wetting and aeration of both soil and soil-less growing media. Cornucopia Plus™ Advantage Grow is utilized for overall plant growth, occasional foliage spray, and for seed germination. Plant extracts make for effective seed treatment.